All of the woodworking plans available at Knottyplans.com are downloadable in Acrobat PDF format. If you don't already have the Acrobat Reader, click here to get your free copy. 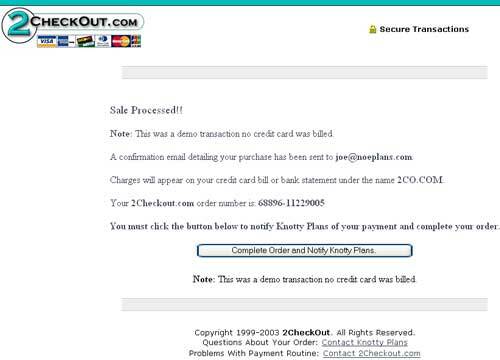 You may purchase our plans from our authorized retailer, 2Checkout.com, Inc, using Visa, Mastercard, American Express, Discover or JCB, Diners credit cards and PayPal. For more information, please visit 2Checkout.com. All prices are in US dollars, however, you may change to your country's currency to calculate your total after you add an item to your shopping cart. step 1. Browse trough our plans selection, once you find a plan you want to download click the download option <add to your shopping cart> button at the bottom of the product. 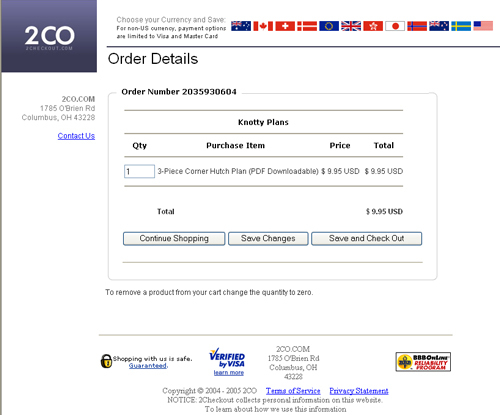 If you want to purchase more plans, click <CONTINUE SHOPPING> and add more items to your cart. step 2. When you've finished shopping, click the <SHOPPING CART> button located at the top of the home page or the one found on your shopping cart page and complete the order form. Make sure the information is accurate as we will not be able to help you if your email address is incorrect. See demo page below. step 3. Upon completion of your order, you will receive a confirmation number, please print/write it down for reference. 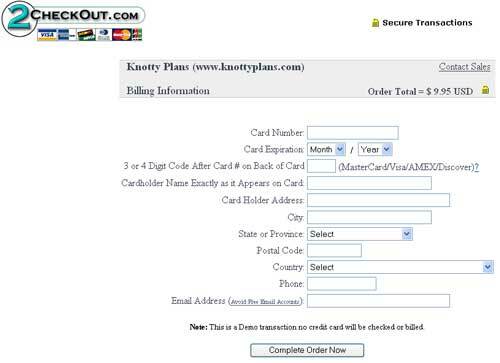 Click on the button <Complete Order and Notify Knotty Plans>. This will bring you to the download page that will list each plan you have purchased, with a <click here> button next to each plan you ordered. 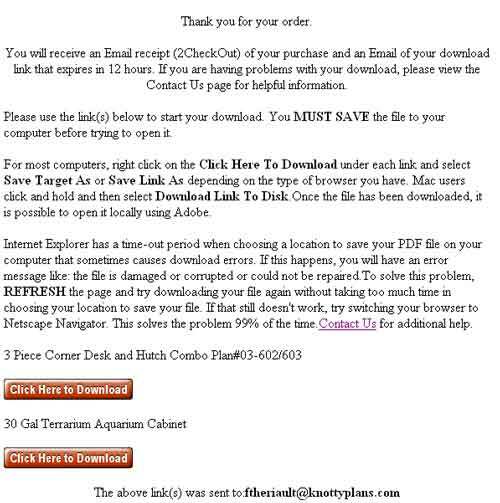 A copy of the download link will be sent to the email that you have provided. Please note that the download link expires in 12 hours. However, if you need more time let us know and we will provide you with a temporary link or we will email you the file as a PDF attachment. Using your computer mouse, click on the <click here> button and select <save as>, (depending on your web browser) and choose a location of your choice to copy the file to your computer. Mac users click and hold. See demo page below. If you are having problems downloading, view our Contact Us page.